This quote from The Great One was made not in regards to his soloing technique, but rather to pay regards to his occasional instances of needing to stretch-and-bend the meter in order to get that last thought in. There’s the notion of “organic time,” the ebbing and flowing of the tempo as the band intensifies, backs off the tempo for emphasis, etc., “perfect time,” the absolute metronomic, dare I say, preservation of the tempo, and “criminal time,” the one where you demonstrate that your timekeeping skills were honed by dropping bags of marbles down stairs, where the spaces between your beats obey Boltzmann statistics, where your band mates “put a warrant out for 1” in the hopes that the local authorities can find it before your solo ends. There will always be places for “organic time” and “perfect time” in music, but “criminal time” is, well, somehow criminal, if for no other reason than you can’t justify exactly how you’ve managed to pull it off and, very likely, can’t make that lightning strike twice. The content below is my own response to being a bit less-than-content with my own time management skills behind the drum set. These audio files are NOT exercises. Ideally, they are designed to show you just how good or bad your time keeping is at a variety of tempos, both in time keeping and soloing, with the ideal intent of improving your time. Six different mp3 files for each of five different tempos (60, 90, 120, 150, 180 beats per minute (bpm)) for 400 measures are provided. One of these six is a constant metronome (call it Series 0). The other five mp3 files are as described in the image below. 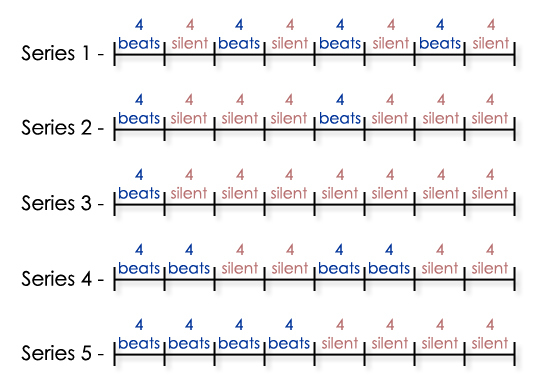 The five series contain combinations of “4 beats” and “4 silents” (4 quarter note rests). I suspect the explanation is now obvious, but these series provide you the listener with 400 measures of combinations of constant pulses and potential free-fall. The intent here is to play as you would and then gauge your ability to maintain the tempo as your “1” either does or does not agree with the next set of beats. Your job is to maintain the tempo and to then consider anything you’re doing behind the kit that keeps you from doing it. Do you over-anticipate the first beat when the pulse comes back? Did it finish faster than you did? Trust me, you will feel it (and the tempo does not lie). Series 0. Simple metronome (download the 120 bpm file). Series 1. The easiest of the series after the Series 0 metronome (download the 120 bpm file). Series 2. Perhaps the second-to-last most difficult, providing only four beats of time before twelve beats of you hopefully keeping up (download the 120 bpm file). Series 3. The worst of the series (download the 120 bpm file). Series 4. Eight pulses, eight rests (download the 120 bpm file). Series 5. The Elvin Special. Four measures of time, four measures of anxious anticipation (download the 120 bpm file). How to use: There are a multitude of ways to use these files. Simple time keeping is, of course, high on the list. 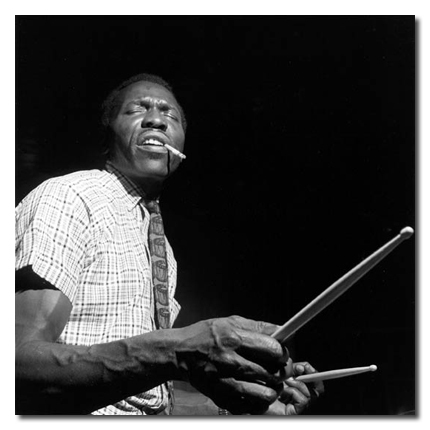 I’ve begun using these files as I develop either one-measure (Series 1) or two-measure (Series 4) “complicated rhythms,” as you can feel prominently if you’re rushing or dragging as you play it by how you come into the next set of beats. The 150 and 180 bpm series are considerable work after several minutes (the 180 bpm being ideal if you ever intend on starting a live dnb band). The one clear trend I’ve noticed is that my right foot (I’m a lefty, so I’m talking about my hi-hat foot) seems to have a much better sense of time than my other three limbs under virtually all situations and, accordingly, I’ve begun to do much more independence work with the focus on making this foot more dependable (we’ve all had our hi-hat “go out” at some point during a solo as our brains hit its mathematical limit). 3/4 and 5/4 time, perhaps other tempos, maybe meter-on-meter audio files may appear here in the future, but 4/4, when done correctly, should give you quite the workout. Each of the five tempo sets and one complete file is provided below in .tar.gz format. If you’re running Linux or OSX, these will self-extract upon double-click. In Windows, you might need Winzip or related. The files are all iTunes-friendly and annotated accordingly. NOTE: Time keeping is everyone’s obligation in the band. These audio files are as useful to bass players as they are rhythm guitarists (well, not necessarily THESE audio files. No magic here, just Garageband). Feel free to comment with ideas or any interesting uses you find.